In this tutorial, you’ll learn to record a screencast video and add it to your course. The screen recording tool makes it easy to record the activity on your screen, so you can show, rather than tell, learners what they need to know. 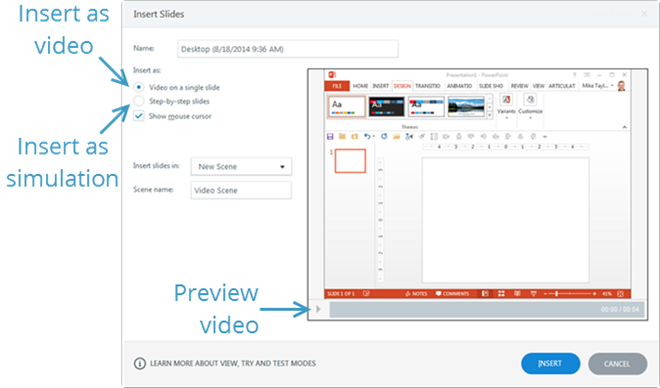 To keep it simple, you'll record how to add a shape to a PowerPoint slide and apply an animation. Open PowerPoint so the screen is ready to be recorded. In Articulate Storyline, click the Record Screen button. Storyline will disappear and a recording window will open. Tip: By default, the recording window is the same size as the slide dimensions in Storyline. This will give you the best screen quality. You can either resize the software to fit in the default frame or grab one of the frame’s corners and resize the recording window to fit the software. You’ll notice that the recording frame’s aspect ratio remains the same. That’s so it will fit perfectly on the slide. When you’re ready to record, click the red Record button. You’ll see a countdown, then you can begin recording your screen. If you have a microphone connected, you can record narration at the same time. Record yourself inserting a shape onto a PowerPoint slide and animating it. Watch the video above for the exact steps. When you’re done recording, click the Done button. A window will appear where you can add a title for the video and choose how you want to insert it. Let’s change the name of our recording to PowerPoint demo. Select the Video on a single slide option and click Insert. Look at the timeline and notice that your screencast is an object like anything else you’d add to the Storyline slide. Save the file so you can use it later in the interactive simulations tutorial. As you can see, recording a video screencast is fairly simple. If you want to add one to your slide, it’s just a mouse click away. At this point you can add shapes, text, or anything else you'd like. In the video above, we added a help button that opened a help layer. See if you can figure out how to do that on your own. Add a trigger to the button that shows the layer. Click here if you want to learn how to edit the video. Otherwise, in the next tutorial you'll learn how to create an interactive simulation.